Toshiba: Too big to fail? Toshiba's future is hanging in the balance. The storied Japanese company introduced millions of people around the world to high-end TVs and laptops. Today, it's struggling through a massive financial crisis that's threatening its very survival. Toshiba warned this week that there is "substantial doubt" about its ability to stay in business, saying its loss for the year ended in March could hit 1 trillion yen ($9 billion). But the industrial giant -- whose businesses employ roughly 190,000 people around the world -- is too important for Japan to let it collapse, analysts say. More than 100,000 of the conglomerate's employees are in Japan, some of them in key industries. Toshiba is pulling out of the nuclear construction sector, the root cause of its current financial debacle. Its troubled U.S. subsidiary Westinghouse Electric filed for bankruptcy last month, and will eventually be removed from the Japanese company's books, leaving a thick trail of red ink. But Toshiba still has a significant nuclear business in Japan. It does decommissioning work at the Fukushima Daiichi plant, the site of a major nuclear disaster after the powerful earthquake and tsunami that hit Japan in 2011. And the Japanese government has a track record of stepping in to save major companies that are in trouble. Toshiba is "too big" for Japan to allow it to go under, said Kazunori Ito, an analyst with research firm Ibbotson Associates Japan. The situation is still precarious. One risk is that banks will stop supporting the struggling conglomerate. But the lenders so far appear willing to hold out for a solution rather than risk losses of their own from a messy collapse. Toshiba owed creditors 1.4 trillion yen ($13 billion) at the end of last year. Downgrades of its credit rating in late December meant lenders had the right to call in some of those loans. But more than three months later, they haven't done so. 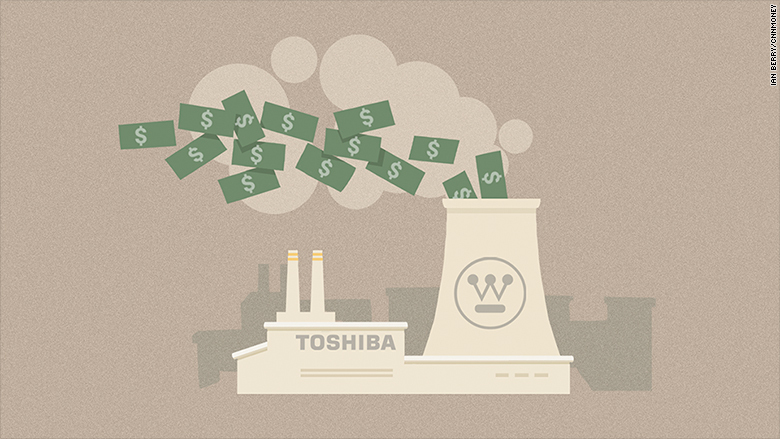 On the stock market, investors have been dumping Toshiba shares in droves. Its stock has more than halved in value since it first warned of a multibillion dollar hit from Westinghouse back in December. And the accounting fiasco resulting from Westinghouse's problems has raised the risk of Toshiba suffering the embarrassment of being delisted from the Tokyo Stock Exchange. The company's management is desperately trying to raise money to offset the huge losses. To do so, they're ready to sell Toshiba's crown jewel. After a previous accounting scandal in 2015, Toshiba had to raise cash in a hurry. It sold off its medical unit for 666 billion yen ($6 billion) last year, saying the sale would help it focus on its core businesses of nuclear power plants and flash memory chips. Now, those units are also on the chopping block. Toshiba has already started distancing itself from Westinghouse. And it's accepting bids for its prized memory chips business, hoping to bring in at least 2 trillion yen ($18 billion). The company is also working to sell an additional 160 billion yen ($1.5 billion) worth of assets to help give it "a sufficient financial foundation," CEO Satoshi Tsunakawa said this week. After all shedding all those businesses, what kind of company will be left? Toshiba says it will now focus on its "social infrastructure business." That means transportation systems and products like air-conditioning units and elevators. But the slew of sales are likely to reduce Toshiba to a shell of its former self, a humiliating fall for the iconic 142-year-old company.